After nearly four decades of plying the skies, Germany's once second-largest airline has stopped operating, with many employees fearing to be left without work amid attempts to sell the remaining assets. While flight crews donned their uniforms and put on brave smiles for the airline's final flights on Friday, bankruptcy administrators continue to work on deals for splitting up the airline's remaining assets amongst buyers. The company filed for bankruptcy administration in August, after cash injections from its principal recent investor, Gulf airline Etihad, dried up. The German airline lost more than three-quarters of a billion euros in 2016 (782 million euros, $909 million), and hopes of turning around the numbers had lost credibility. A German federal government loan kept the company's aircraft flying for a few months, to look after the interests of its clients and employees whilst administrators negotiated deals with other airlines to buy routes and planes, and an effort was organised to find new jobs for the airline's air, ground, and administrative staff. Just a few years ago, Air Berlin was Germany's second-largest airline. It was cherished amongst Germans for its flights to holiday destinations, especially to Mallorca, an island off the eastern coast of Spain that's beloved amongst Germans, Swedes and Brits looking for a break from the grey-brown tones of northern Europe. In contrast to some of its cut-price budget airline rivals, Air Berlin made small gestures to keep its customers sweet, distributing chocolate hearts at the exits after every flight. But its low-cost rivals - especially EasyJet and RyanAir, increasingly pressured Air Berlin's margins. The company had taken on a lot of debt by borrowing money to finance acquisitions over the years — a growth strategy that eventually overreached. Air Berlin was founded four decades ago by an American pilot, Kim Lundgren, who took advantage of the fact that at the time, the post-war treaty amongst the victorious powers specified that only carriers based in Britain, France, or the United States were permitted to fly to West Berlin. The first Air Berlin flight from Berlin's Tegel Airport left for Palma de Mallorca on April 28, 1979. After the Berlin Wall came down, enterpreneur Joachim Hunold acquired a majority stake in the airline, and a phase of rapid growth via acquisition began. When Abu Dhabi based Etihad, which had invested heavily in Air Berlin in recent years, lost hope of the airline's return to profitability in August, the fate of Air Berlin's 8,000 employees hung in the balance. Negotiations for a transition of the company's assets - above all, its starting and landing slots and its aircraft - occurred alongside a search for opportunities to keep its employees in work. What emerged was that the bulk of Air Berlin's airplanes and landing slots will be taken over by Lufthansa, as will some 3,000 employees, who will move to Lufthansa's low-budget subsidiary EuroWings. The deal with Lufthansa will allow administrators to repay in full the 150 million euro loan that was extended by the German government to keep Air Berlin flying whilst wrap-up negotiations were underway. 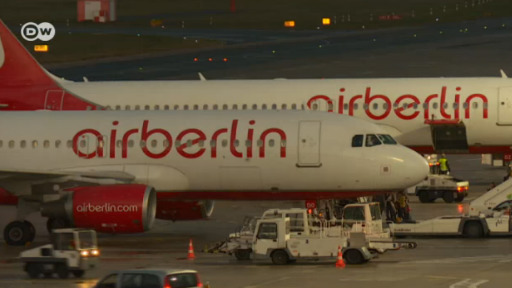 Talks are on-going to transfer additional Air Berlin assets and employees to EasyJet and Condor, two budget airlines. The head of the bankruptcy administration team, Frank Kebekus, told public broadcaster ZDF this week that "we are working on the assumption that we can transfer 70 to 80 percent of jobs" when all is said and done. Also this week, Berlin's mayor urged any administrative employees of the airline who were still looking for jobs to apply for positions with the Berlin city government, which has several hundred unfilled positions available for qualified people. Berlin-based Germania airline has stopped all flights and applied for bankruptcy after failing to cover a "short-term liquidity problem." The carrier had been transporting over four million passengers a year. From chocolate hearts to leather seats, Air Berlin fans have thousands of items to bid on. The items are expected to have cult status among collectors, according to the auction house's managing director. China launches a resolute defense of its key foreign policy, denying that it would trap countries in unsustainable debt.